I do not use the best things I have. In my pajama drawer I have two types of pajamas. The beautiful, lovely matching kind (I went on a loungewear buying shopping spree in London last year at Intimissimi and picked up the most gorgeous sets of pajamas!) and the kind that have loooong since seen better days. You know- Calvin Klein night slips that were gorgeous two years ago but now have frayed or torn lace, or a cotton pajama night set that has seen the washer one too many times. And yet, I found myself hesitant to get rid of my old pajamas- in fact, I didn’t get rid of any of them (after all, I do love that Calvin Klein slip!) and I moved on to my workout clothes. There I noticed the same trend. I have some lovely yoga pants and tops from Hard Tail and Lucy yet I found myself hanging on to the ratty college t-shirt and cut off sweats of years past. That is when I paused. Why could I simply not let go of the old stuff and only keep the best? Why would I want to wear a tatty old slip when I could lounge in my beautiful sea green silk pajama pants and matching chemise? Why would I want to take my dog on a walk in faded old sweat pants when I could sport a beautiful, flattering workout ensemble instead? What was I saving my best for? An invitation to Buckingham Palace?! In short… why was I not using the best things I had? So quickly, without thinking about it too much, I placed all of the questionable items in a bag and got rid of them on the spot. 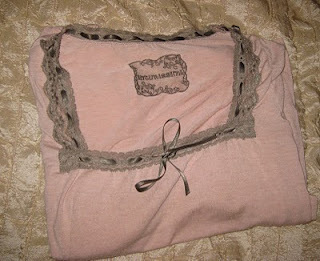 I have spent the week lounging in my absolute best and I can’t tell you how gorgeous and liberating it feels. I would love to know… do you use the best things you have? 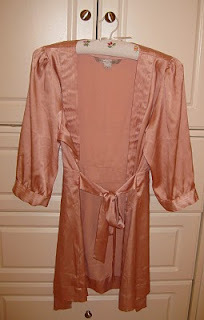 Pictured above are two of my current favorite lounge wear garments... a pink lace night shirt from Intimissimi and a satin pink dressing gown from Victoria's Secret. And the secrets of Will’s past are slowly revealed as Lee weaves Claire and Will’s story with that of Will’s earlier love affair- one that took place ten years earlier on the brink of World War II with Trudy Liang, a beautiful Eurasian socialite. Trudy and Will’s love never quite stood a chance as the brutal reality of war tore their whimsical and carefree lives apart in the darkest way possible. 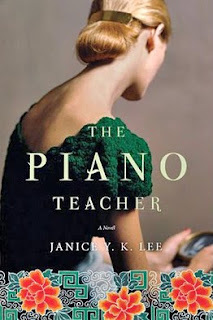 Lee’s prose in The Piano Teacher is sparse and haunting. She makes you long to know more about her characters- to find out their secrets- to understand their pain. This fascinating book mesmerized me, was a thrilling read and I highly recommend it. Buy three of the same ankle pants in different colors just because they are on sale, even though she isn’t quite sure about the fit. Take her time and realize that the ankle pants on sale actually aren’t very flattering. Decides to save her money to purchase a higher quality article of clothing that isn’t on sale in the future. Eat an entire box of prepared Kraft Macaroni and Cheese while surfing the internet. Prepare plain pasta and grate fresh gruyère cheese on top and serve with a simple salad and a glass of wine. Eaten alone while listening to music. Pick a fight with her husband because he didn’t load the dishwasher in the most efficient way possible. Pause when agitated- appreciate her husband for who he is and realize that it’s not Jeanne’s way or the highway. Rather than pick a fight, she decides to take a bubble bath instead. Eat waaay too much at a cocktail party and silently curse her aching tummy on the way home. Delight in a few tasty hors d’oeuvres until she is no longer hungry. Focuses more on conversation instead. This list could go on forever so I have decided to write down my observations regarding What Would Jeanne Do? And share them with you as they come. I would love to know- how has your alter ego inspired you? Labels: Comme les Français, lifestyle, What Would Jeanne Do? Some of Anne’s suggestions are practical and relatable… some are a little more over the top. One of her suggestions is that you give yourself a French name. You know, a sort of alter ego. Her theory here is that your chic French alter ego will keep you in check from doing very un-chic things. I remember the first time I read this I laughed it off as a silly gimmick but quickly I realized that, while a little nutty (I don’t know how many people I would actually admit this to) giving yourself a French name actually works! Alas, my French alter-ego, Jeanne, was born. And with Jeanne, came a new feeling of confidence. Jeanne actually debuted in France- not when I lived in Paris but a few years before that when I spent the summer in the South of France (more on that in later posts). Jeanne is chic, she is confident, she can tackle the world and do it in style! A huge rainstorm hit Southern California this week and amidst all of the rain and thunder and utter chaos, I bravely ventured out of my home to go to the grocery store. Up until my grocery store trip I had been doing laundry and working on my book, so I did not think much about what I looked like when I bolted to the store at the first sign of sun. I gathered the items I needed and while standing in line I caught myself in a mirrored reflection. I was wearing (I shudder to recount) a white velour tracksuit, black Ugg boots, a plaid wool coat, my hair in an unkempt ponytail and no make up. I nearly fainted from the sight. I would love to know... what is the name of your French alter ego? A model wearing Jean Paul Gaultier is pictured above. Labels: Comme les Français, France, lifestyle, What Would Jeanne Do? 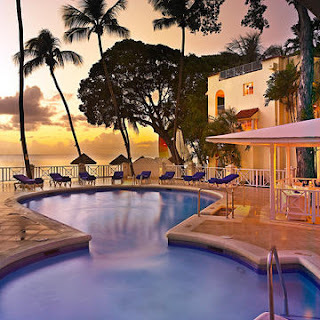 At my resort in Barbados there were people from all over the world- Great Britain, America, Italy, Spain- but you can guess which ones I was singularly interested in... Mais oui, the French. 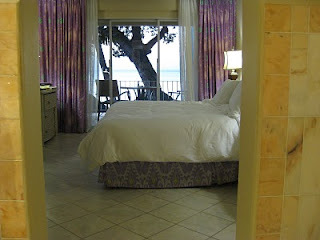 I wanted to find out how they vacation and what differences (if any) they had from the other guests. There were only two couples from France staying at our hotel (they were not together, in fact one couple was there the first half of the week and the other the second) but these two couples spoke volumes about French culture. Most of the women in the resort (myself included) wore metallic espadrilles (mine are gold- I love them!) and bejeweled cover-ups but the French women carried their understated dress sense through to their resort clothing- a simple purple dress, a floppy hat, ballet flats and sandals- and no make up. C'est tout. I don’t think either option is necessarily better- in fact I think they are both fine- anything goes on holiday. I tend to be more understated in my every day dress sense so when I go abroad to catch some sun I like a flashy sandal or a turquoise colored wrap. The French women seemed completely unfazed by this. 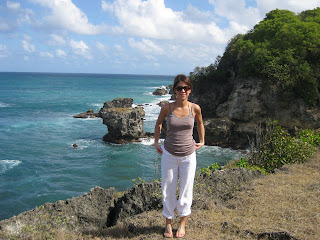 Their resort clothing was simple, uncomplicated and body conscious. Our hotel offered a sumptuous, complimentary breakfast buffet. Every possible breakfast choice was on offer: pancakes, bacon, scrambled eggs, baked beans, hash browns, bagels and cream cheese. I am terrible when it comes to buffets. I want to try it all (so that I know what’s good, you see). Both French women I observed had a large bowl of fruit, plain yogurt and a cup of coffee every morning... completely ignoring the other tempting options! With one of the women, I kept thinking that the fruit was her “starter” and waited for her to get up and indulge in some pancakes or at least scrambled eggs. But no, that never happened. She simply sat there, completely unfazed by all of the tempting options, enjoying her bowl of fruit and talking passionately with her male companion. 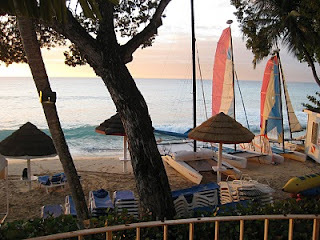 There was one thing about the second French couple at the resort that both my husband and I marveled at: They did not stop talking to each other! Ever! We encountered them first at breakfast (where the French lady was demurely eating her bowl of fruit and I looked guiltily down at my apricot pastry). That morning they talked about everything from politics to cinema to weather to art (meanwhile B and I happily read our respective papers in silence- I the New York Times and him Britain Today). Then later that afternoon, the same couple sat in the sun beds next to us by the pool- where they continued to talk to each other. About what? I’m not sure- at this point I was trying to read my book and have a lazy afternoon swim. 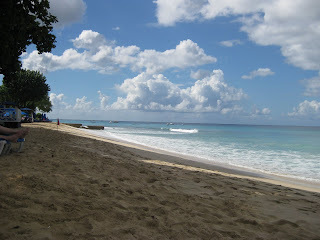 Later that day B and I took a long walk up the beach to Sandy Lane and on the way back we encountered the same couple having yet another animated conversation with each other. B turned to me and said, “How do they not run out of things to talk about? !” I, too, was very amused by this. I consider myself to be happily married and have a good healthy relationship with my husband, but this French couple- who loved to talk to each other so much- made me feel like B and I were giving each other the silent treatment! Some of you might be shocked to see I am reviewing a mystery that is not by Alexander McCall Smith. Yes, I do read books by other authors- it’s just that when I find an author I like I am a devoted fan, usually for life. 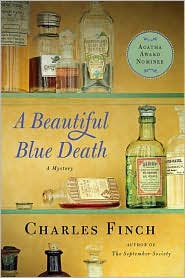 Which is why I am so thrilled that I read the debut novel by Charles Finch entitled, A Beautiful Blue Death. A Beautiful Blue Death takes place in Victorian England (plus number one) and follows amateur detective and highbrow gentleman extraordinaire Charles Lenox as he tries to solve the murder of a local servant named Prudence Smith. Lenox was put on to the case by his beautiful young widow neighbor, Lady Jane Grey, who used to employ Smith. Lenox, whose favorite past time is sitting in front of his fire with a cup of tea, a pipe and a good book, wholeheartedly goes in to solve the case, which leads him through the upper echelons of London society (where he fits in quite nicely) to the dark underbelly of Victorian England’s crime ridden streets (where he fits in… not so much). A cast of delightful, suspicious supporting characters, a valiant butler and a double murder round out this very impressive debut novel and has subsequently left me longing for more. Luckily this is the first in a series and I am actively seeking out Finch’s second book The September Society after I post this.